Doesn't leak, mixes things well, has measurements down the side. Also been putting in the dishwasher and it's survived fine. Would buy again. Good beaker for my general use after a workout. The lid fits snugly and doesn't leak often, though one time, protein did leak over my pants. The lid is very annoying when drinking the shake. It always pokes my face when drinking. Will be buying a different one. 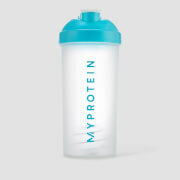 Ordered myself a shaker as well as Whey Protein - and to be honest very happy with both purcahses. Arrived very quickly and safely packed. 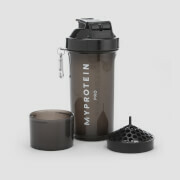 Nice looking (as shakers go) and the mesh grill saves you from big lumps. Not so good is that it's not completely leak proof - every now and again I get a small amount of shake running down my fingers so I've taken to swirling horizontally rather than shaking vertically... but that only works with a shaker ball which this does not come with! So overall, it's ok and I'll keep using it but I might look a little more 'up market' for my next one. Great and practical product and does exactly. My only gripe is that the cap gets in the way when drinking directly from the shaker. It has been really well thought out as a product but this is the only sticking point - so back to the product design team and you'll get 5 stars if improved upon! Love the removable sieve to trap any bits. 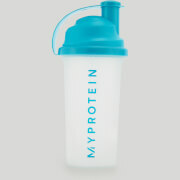 Great shaker, leaves no lumps after only a few shakes. Lid is quite tight and hard to open at times as with the cap but a very good shaker all round. Mixes up my pre workout along with protein well enough, however there is a leak somewhere round the lid, makes the product unusuable, waste of a few quid!